Most of the solutions for dependency injection in React components are based on context. I think that it’s good to know what happens under the hood. As the time of this writing one of the most popular ways for building React apps involves Redux. The famous connect function and the Provider there use the context. Context is an advanced and experimental feature. The API is likely to change in future releases. Most applications will never need to use context. Especially if you are just getting started with React, you likely do not want to use context. Using context will make your code harder to understand because it makes the data flow less clear. It is similar to using global variables to pass state through your application. If you have to use context, use it sparingly. Regardless of whether you’re building an application or a library, try to isolate your use of context to a small area and avoid using the context API directly when possible so that it’s easier to upgrade when the API changes. In this article we are going to learn how we can use an IoC container to inject a value into React components without passing it explicitly through each component and without using the React context. 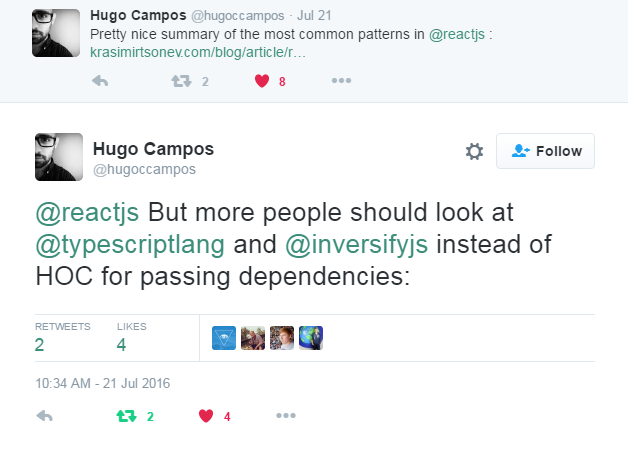 We are going to use InversifyJS as IoC container and TypeScript as programming language. We are using InversifyJS because it works in both Node.js and web browsers. This is an important feature because some React applications use server-side rendering. We are also using TypeScript because it is the recommended by InversifyJS. However, property injection works nicely if what we want is to pass dependencies to components without passing them explicitly through each component. Let’s take a look to a basic example. We need to start by configuring the IoC container. In InversifyJs we need to create a dictionary that maps a type identifier with a type. The dictionary entries are known as “type bindings”. In this case, we use a binding to map the identifier UserStore to the class UserStore. This time the identifier is the Class but InversifyJS also allow you to use Symbols or string literals as identifiers. Symbols or string literals are required when we use interfaces. We also need to generate a decorator using the function makePropertyInjectDecorator. Injected properties are lazy evaluated. This means that the value of the userStore property is only set after we try to access it for the first time. Please note that in the future releases of InversifyJS the function makePropertyInjectDecorator will be removed. It will be provided by its own module: inversify-inject-decorators. The lazyInject decorator is the equivalent to the previously known as pInject decorator. The main advantage of using an IoC container like InversifyJS is that we are not using the context! pageTitle: "Some text for testing..."
You can find some real use cases of InversifyJS with React here and here. You can learn more about InversifyJS here. Please feel free to share thoughts about this article with us via @OweR_ReLoaDeD, @InversifyJS and @WolkSoftwareLtd. Don’t forget to subscribe if you don’t want to miss it out future articles!